« Requirements specification. Basic principles. Here, the capacity is the indicator of how much traffic (the maximum) a site/advertising space can support. We usually do a good job predicting an advertising space’s general traffic; additionally, we can analyze the rate of growth of traffic and take that into account as an additional factor (for example, supposing the rate of growth remains more or less constant). In the end, we extrapolate existing statistics for making forecasts for every advertising space. An important element of advertising traffic is seasonality, which is to say that the time distribution of traffic strongly corresponds to calendar intervals. Weekly traffic has the tendency to repeat on corresponding days of the week; weekend and holiday traffic usually differs from workday traffic. Seasonality manifests itself differently on different advertising sites and even advertising spaces on one site. Some sites see surges in attendance during working hours, some the opposite. In order to make a more exact forecast, calendar adjustments must be introduced. When extrapolating data, we must consider which calendar “areas” we want to make a forecast for. If it’s a non-workday, for example, then traffic will be more representative of a weekend. If they are morning hours, then it’s best to extrapolate statistics for morning hours. The more seasonal factors we consider, the better the forecast will be. In doing so, it is of course necessary to understand that such improvements are not free. 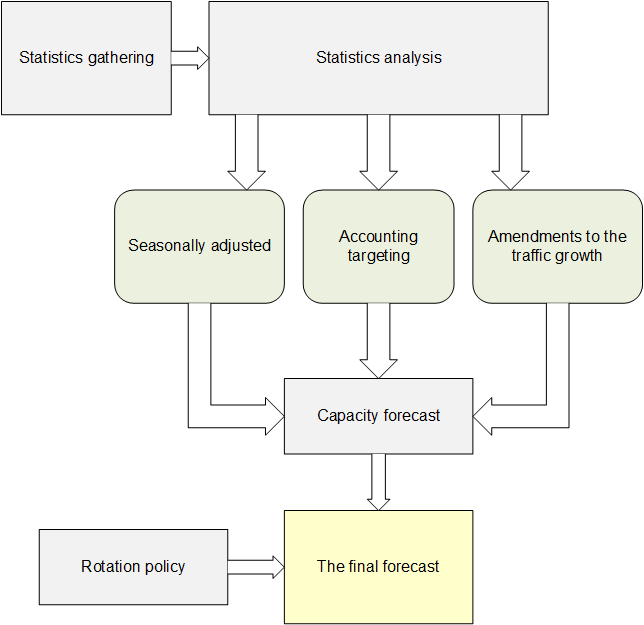 The forecasting algorithm gets more complicated and the need for additional “calendar” grouping statistics appears, which leads to a fast increase in the amount of historical data. At first glance though, the amount of median historical data (operative statistics) apparently stays the same as before (earlier, 100 million events passed through an advertising system); it will still be the same amount, but now where did the increase come from? The increase appears because all of the median statistics need to be grouped for usage in the forecast. The more “calendar points” the forecast system uses, the more groups that appear during the grouping. It’s easy to understand that reporting statistics by months of the year increases the number of such groups 12 times at least (when saving data for 1 year), reporting statistics by days of the week, at least 7 times (if data is only saved for one week), etc. The general principal: the more exact we want to make a forecast, the more costly it becomes in terms of software and hardware resources. Targeting conditions can overlap one another in a nontrivial way. Targeting conditions conceptually divide the advertising space’s general traffic into separate intersecting segments (which is why the actual targeting conditions are often called segmentation variables). 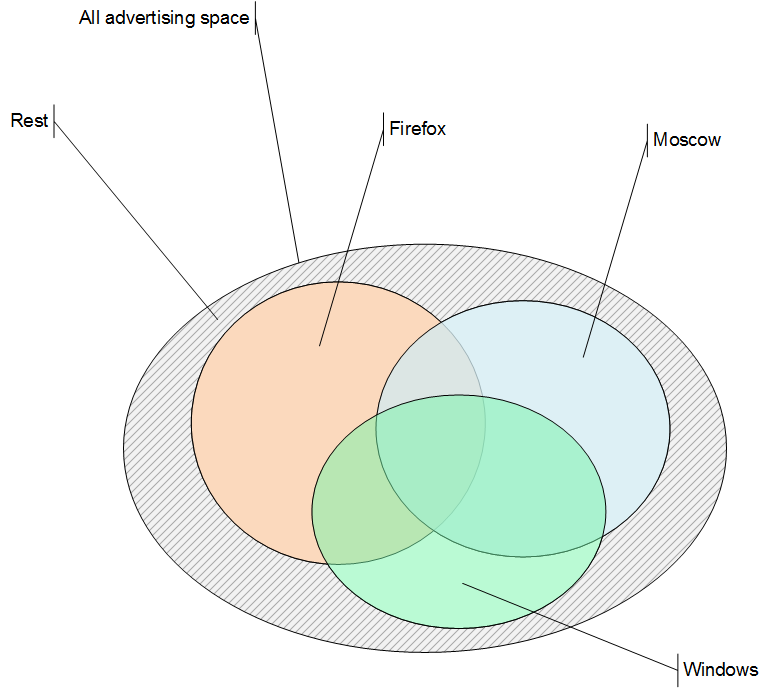 In the given example, 3 targeting variables form 4 intersections: Firefox & Moscow, Firefox & Windows, Moscow & Windows, Firefox & Moscow & Windows. There is also a grey zone, the rest, where users who don’t fit into one of the conditions fall. Overall, these segments form all of the advertising space’s traffic. 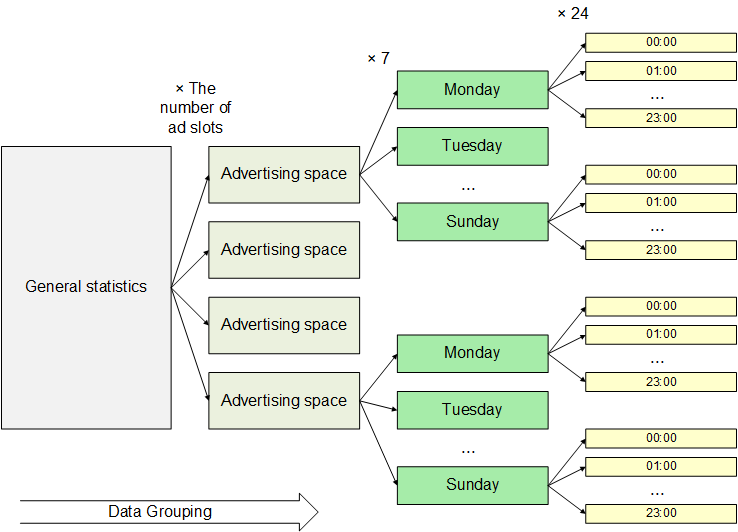 Above, we analyzed general statistics with the goal of forecasting an advertising space’s capacity. You can deal with targeting conditions similarly. For this, grouping of statistics will be carried out based on set of targeting variables. You can roughly estimate the number of groups above by multiplying the number values for each variable (there will be a condition where all conditions intersect each other). If we imagine that we have not three variables, but ten, and each variable can have 100 values, the amount of data can grow to epic proportions. Of course, we are scrutinizing the values above, that is to say that only a part of all those combinations will be possible; which part exactly can only be understood after this data has been collected. ОS – Windows makes up 80% of the general capacity. How can you approximate the number of Internet Explorer & Windows combinations? First of all, it’s obvious that it is not bigger than the amount of each separate variable, i.e. it does not exceed the minimum of these two – 20%. We can still suppose that the number of Internet Explorer users among Windows users is proportionate to the general number of Internet Explorer users. Supposing this, the Internet Explorer & Windows capacity we have makes up 20%×80% = 16% (this estimate, of course, deviates from the reality we know, which is that every IE user is a Windows user with nearly 100% probability). In the end, we get a rough estimate of 16-20% of the general capacity. A similar estimation system can be used for three variables and up. It makes sense that the accuracy of an estimate like this is not very precise; it can be enhanced, additionally batching statistics of not only separate variables, but of pairs and even triple variable combinations, for example. This will be the tradeoff when the number of combinations (and consequently, the amount of data) is maintained in several frames, raising the accuracy of the forecast. At a certain stage, we received an estimate for the capacity of some targeting variable combinations. This data was not enough to compile a final forecast. As you know, several arrangements can be rotated on one advertising space. Thus, in order to make a forecast for one placement, all of the ads which will be competing with it on the advertising space in the future must be known. More importantly, adding new ads to the system influences the forecast of all other ads intersecting it (it’s understandable that an added placement “takes away” from the remaining traffic again). A sample system for rotation forecasting will be discussed in the following section. So, for compiling a proper forecast, we need to accumulate a sufficient amount of statistics on the advertising space. To do this, the more accurately we want our forecast, the larger (the difference can several times more) the memory consumption and processing time will be. Dynamic element – calculating the final forecast of a space taking rotation advertising space rotation into account.